Unsurprisingly, the big story this week was the jump in interest rates. As always, clicking on the link and reading the post is not only informative, but helps put a little cash in my wallet. Manufacturing jobs rose +18,000 for an average of +23,000/month in the past year vs. the last seven years of Obama's presidency in which an average of 10,300 manufacturing jobs were added each month. But other, longer-term aspects *maybe* revealed fraying around the edges: the rise in those who aren't even in the labor force but want a job now, the stalling of the YoY employment to population ratio, and the decline below 2 million in the YoY household number (at turning points, the household survey has a tendency to lead the establishment survey. While we are waiting for tomorrow's jobs report, let me update my alternative Fed funds + payrolls leading indicator for the economy, which I debuted earlier this year. This was the result of looking for an interest rate indicator that did not rely upon the yield curve. This indicator is really simple, and what it predicts is, if the Fed fate rises YoY by as much as the YoY% change in jobs growth, the economy will fall into recession within roughly a year. It's been infallible since the 1960s. The YoY change in the Fed funds rate is +1.0%, while the YoY% change in payrolls, through August, was +1.6%. No recession is signaled by this model for the next 12 months. But wait, there's more! Because the change in the Fed funds rate seems to have a predictable relationship to the YoY% growth in jobs over the next 12-18 months, let's take a look at that. A 1% increase in the Fed funds rate has historically strongly correlated with roughly a 1% decline in the YoY *rate* of job growth. In fact, 12 out of the 15 times since the late 1950s that the Fed funds rate has risen by 1% or more YoY, the YoY rate of job growth has declined. In the remaining 3 times, it declined no later than 19 months out. The YoY rate of job growth went up more than expected in 2014, and hasn't declined at all in the last year. The last year is probably explained by (1) anomalous increased spending for repairing hurricane damage last autumn, and (2) the fiscal stimulus passed by Congress last December [Note: it may be a very inequitable and inefficient stimulus, but it was still a stimulus]. The model cannot be expected to account for either of these. All of which means, left to its own devices, the YoY effect of the stimulus is going to end by roughly next February. And although Hurricane Frances was bad, it wasn't nearly so bad as the trifecta of bad hurricanes one year ago. Which means I expect the relationship to re-assert itself by early next year: monthly job reports should average less than +1.6% YoY, or less than +200,000 per month, and most likely closer to +0.6% YoY (the current +1.6% minus 1%), or about +75,000 per month, by the end of next summer. In short, this is yet another long term indicator strongly suggesting a significant summer slowdown next year. I don't think I have seen as badly, or worse, outright misleading reporting in a long time as I have seen concerning September auto sales. Almost all of the stories -- and especially the Doomish punditry that dominates the clickbait econoblogosphere -- have seized on the BIG BIG DOWNTURN!!! 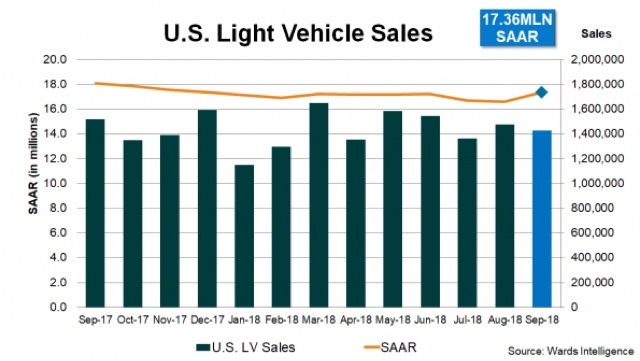 in auto sales YoY, varying between a -5.6% decline ("So, all in all it was a lousy month") to a 7% decline ("Auto sales sputtered ... Several major auto makers reported steep declines in U.S. sales"). Or, "U.S. Auto Sales Look Shaky, Could Be Start to Rough Road Ahead." OMG, head for the hills! Then, down maybe 10 paragraphs (if at all), it's noted that the YoY comparison is with the spike in replacement sales that occurred after Hurricane Harvey dumped up to 50" of rain on east Texas, including the 6 million population Houston metro. So, how does 17.3 or 17.4 million look compared to recent data? There were only two months since the beginning of 2017 that exceeded 17.3 million sales annualized, one of which was last September. In fact, 17.3 million units is right in line with average sales during the best two years of this expansion. And, speaking of hurricanes, Florence probably knocked out sales for the eastern halves of North and South Carolina last month. Since the population of these two states combined is about16 million (or about 4.6% of the US population), figure that Florence subtracted a little over 2% from this September's sales. 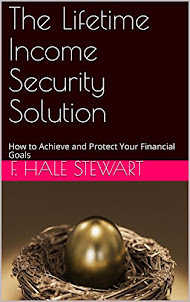 Adjusting for that would bring sales to 17.6 or 17.7 million annualized. These tend to have lengthy plateaus during expansions, and turn down about a year before the next recession. Give me a couple of months in a row under 16.5 million units, and I'll start to worry. In the meantime, spare me the ignorant or misleading reporting. Yesterday construction spending for August was reported. While overall spending rose very slightly, residential construction fell -0.7%. The big issue with housing this year is whether higher mortgage rates and higher prices are leading merely to a deceleration of growth, or to an actual turning point. Yesterday's report adds to the evidence that it is the latter rather than the former. My detailed post is up at Seeking Alpha. As usual, besides being informative, reading the post also rewards me a little bit for my efforts. UPDATE: I was looking for something else this morning, and found this. And indeed, permits have since been a little worse than flat, and residential construction has indeed followed. As I point out from time to time, you're reading the right blog! The Trump Administration's trade war hasn't hurt manufacturing and production yet. At least that's the message from this morning's ISM report on manufacturing. The September PMI®registered 59.8 percent, a decrease of 1.5 percentage points from the August reading of 61.3 percent. 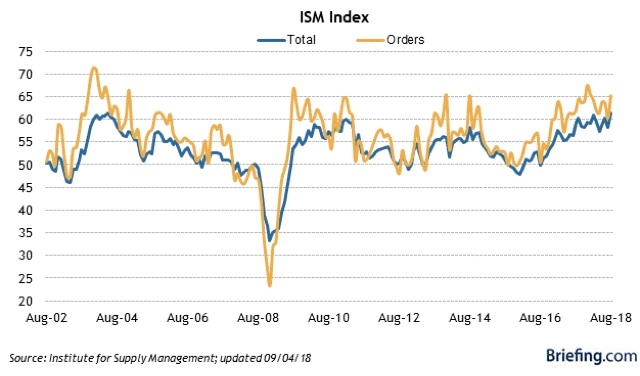 The New Orders Index registered 61.8 percent, a decrease of 3.3 percentage points from the August reading of 65.1 percent. Both the overall index, and the new orders subindex, were in the range of earlier readings this year. Industrial production, particularly in the Oil patch, has been running hot this year. There has been some evidence of "front-running," i.e., getting orders in before the tariffs take effect, in things especially like weekly railroad carloads. Going forward, what to watch for is new orders falling below their range from earlier this year, i.e., significantly below 60. But there is no evidence yet of tariffs hurting the sector so far. 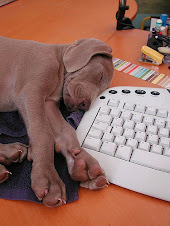 Regular economic blogging will resume later today. In the meantime . . .
As I may possibly have mentioned once or twice before, I am a total nerd. 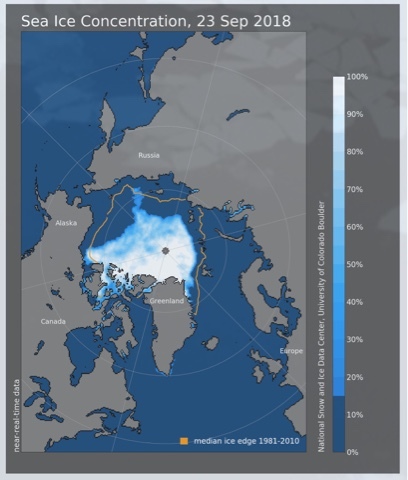 One of the web sites I watch is NSIDC's site tracking arctic sea ice. To be honest, I'm a little surprised that it is still functioning, since the Trump Administration believes that climate change is just a Chinese hoax, so I thought they would take it down almost immediately after coming into office. Guess they haven't found it yet! All that was left was a rectangular shaped piece in the middle of the ocean into the Canadian archipelago, and a narrow salient reaching towards eastern Siberia. While the "Northwest passage" on the American side never quite opened up this year, the "North sea" route on the Asian side was open for several months. This was tied for the sixth lowest minimum sea ice extent in the last 40 years. Not only did the amount of sea ice remain in the bottom 10% of all seasons in the last 38 years -- in fact, while not shown, it was in that bottom 10% all last autumn and winter as well, i.e., for the entire year -- but note on the graph the time during September that sea ice has reached its minimum previously. At all levels the minimum was reached earlier in September than it was this year. The minimum extent was reached 5 and 9 days later than the 1981 to 2010 median minimum date of September 14. The interquartile range of minimum dates is September 11 to September 19. This year’s minimum date of September 23 is one of the latest dates to reach the minimum in the satellite record, tying with 1997. 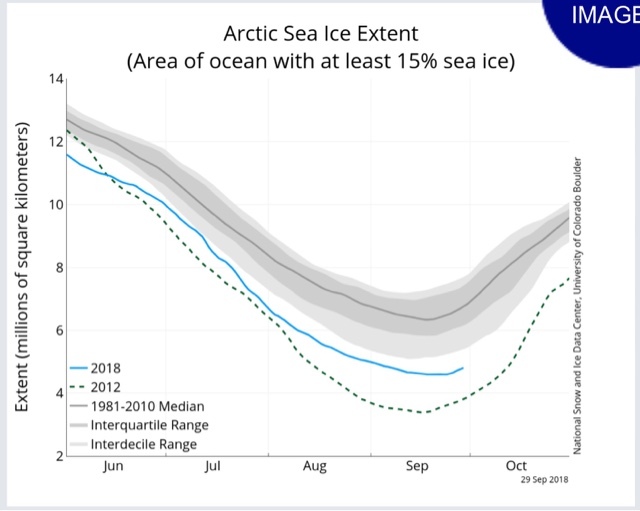 It makes sense that, if the arctic is warming, sea ice would reach its minimum later and its winter maximum earlier., since average temperatures above freezing would be the case for more of the year. Man, those Chinese hoaxers sure are going to massive extremes to create fake evidence! If the Congressional GOP had their druthers, they would probably like the autumn mid-term narrative to be about a strong economy, low unemployment, a tax cut, and a big increase in military funding. In vulnerable districts, they'd like to run on local issues, as would GOPers running for state and local offices. But I knew that was never going to happen, because Trump wants the spotlight to be on him and him alone, 24/7 and always. So it was inevitable that he was going to stomp all over whatever narrative the GOP wanted to tell, with controversey after controversy after controversy. He's right back at the low point he was last December before the tax cut brought the country club wing of the GOP back home. His high point was the summit with North Korea's Kim in June. But this was immediately followed by the disastrous Helsinki summit with Putin, and recently by a very unpopular nomination of Brett Kavanaugh to the US Supreme Court. After last week, one almost wonders if the GOP is aiming to get exactly zero votes from any woman anywhere. This isn't going to change in the remaining five weeks before ethe midterm elections. Trump is going to keep on creating new controversies, stomping all over any othe news. He will ensure that he is the only issue on the ballot, for races all the way down to dog catcher.